Focus Modes Tutorial for Nikon D3300. In this post you will learn about using the various focus options on your Nikon D3300. The same is applicable for most DSLRs with slight variations. Different focus modes help you to get the focus spot on your subject. There are a few creative variations like recomposing after the focus is set and so on. On the Nikon D3300 you can either choose Auto focus or Manual focus. Both have their specific advantages and disadvantages. Auto focus helps you to quickly focus on the subject while in manual focus mode you will have to manually turn the focus ring on the lens to focus on specific area of the subject. You should use viewfinder for best results while focusing on the subject. There is little or no contrast between the subject and the background. The subject is of the same color as the background. Subject is half in shade. Subjects inside a gate or cage. Background object is larger than the subject. Subject is too small with fine details. AF-Assist Illuminator: When the subject is poorly lit, AF-assist illuminator will light automatically and project a beam of light when shutter button is pressed halfway. This feature may be turned off from Menu settings if not required. List of various focus modes available on Nikon D3300. Out of these four focus modes AF-S and AF-c are available only in the P,S,A and M modes. In this mode the camera automatically selects single servo auto focus if the subject is stationary and continuous servo auto focus if the subject is moving. Basically it combines both AF-A and AF-S, but the camera itself chooses what is best for the situation. This is ideal focus mode when the subject is showing unpredictable movement. Eg. Children walking around. Note that the shutter will only be able to be released when the camera locks the focus. If the camera is unable to focus correctly you will not be able to click the photograph. This mode is used for stationary subjects. Focus is locked on subject when you press the shutter button halfway down. After pressing the shutter halfway down you should not move your camera. This focus mode is good for still photography. Eg. Product shoot. This mode is used for moving subjects. Camera will continue to focus on wherever the subject goes when the shutter button is pressed halfway down. This is ideal for shooting birds and wildlife. The camera uses predictive focus tracking where it predicts the direction of movement of the subject. This focus mode should be combined with burst shoot (4-5 images per second) for best result. Manual focus is used in conditions where the auto focus is not able to deliver the desired result or for greater creative control. To use this mode you need to switch A-M mode switch on the lens to M.
Adjust the lens focus ring until the right area is in focus. Note that the camera will take photo even when the right area is not in focus. You can use live view display to enlarge image and check if you focused on the right area. How to choose correct focus mode? To display focus mode options press the i button on the camera body which will highlight the current focus mode in information display on the screen. Choose it and press OK. Then select desired focus mode using left or right navigation button and press OK again. How to choose correct focus point in Auto focus mode? Single-point AF: This is used for stationary subjects and the focus point is selected manually. Camera will focus that specific point. Dynamic-area AF: This is for moving subjects. Its works only in AF-A and AF-C modes. 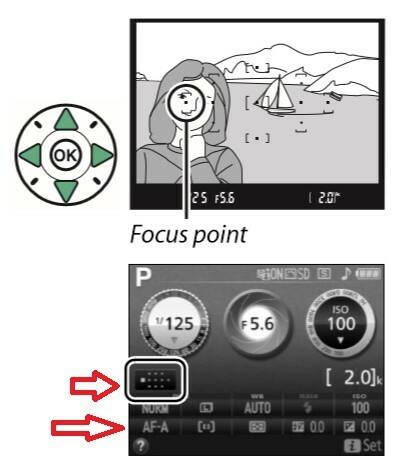 You can select one focus point but the camera will focus based on information from surrounding focus points if subject briefly leaves the selected point. 3D-tracking (11 points): It works only in AF-A and AF-C modes. If the subject leaves the selected focus point the camera uses 3D-tracking technology to select new focus point and keep the focus locked on the subject while the shutter button is pressed halfway down. If the subject leaves the viewfinder then remove your finger from the shutter and recompose the photograph. Auto-area AF: Camera will automatically detect subject and select focus point based on the subject. if you don’t have one. Let us know in comments below about Focus Modes Tutorial for Nikon D3300. Ask us if you have any specific query. Read about the best lenses to upgrade from your kit lens here. Read 10 Photography Tips for better results here.